Fatsia japonica, also glossy-leaf paper plant, fatsi, paperplant, false castor oil plant, or Japanese aralia, is a species of flowering plant in the family Araliaceae, native to southern Japan, southern Korea, and Taiwan. The name fatsi is an approximation of the Japanese word for 'eight' (hachi in modern romanization), referring to the eight leaf lobes. In Japan it is known as yatsude (八つ手), meaning "eight fingers". The name "Japanese aralia" is due to the genus being classified in the related genus Aralia in the past. It has been interbred with Hedera helix (common ivy) to produce the intergeneric hybrid × Fatshedera lizei. It is an evergreen shrub growing to 1–3 m (3 ft 3 in–9 ft 10 in) tall, with stout, sparsely branched stems. The leaves are spirally-arranged, large, 20–40 cm (7.9–15.7 in) in width and on a petiole up to 50 cm (20 in) long, leathery, palmately lobed, with 7–9 broad lobes, divided to half or two-thirds of the way to the base of the leaf; the lobes are edged with coarse, blunt teeth. The flowers are small, white, borne in dense terminal compound umbels in late autumn or early winter, followed by small black fruit in spring. This plant and its cultivar F. japonica 'Variegata' have gained the Royal Horticultural Society's Award of Garden Merit. An ornamental plant, F. japonica 'Spider's Web' (or 'Spider White') is a rare cultivar with variegated leaves. Slower growing than the original species, it reaches a lower maximum height of 2.5 m (8.2 ft) at maturity. The dark-green leaves are strongly white-flecked, particularly at the edges, though the white variegation may occasionally disperse across the whole leaf. The variegation may change with the seasons and as the plant ages. Terminal clumps of white flowers emerge in autumn, which are followed by black berries. While grown as a landscaping plant, it has also become naturalised in some areas. In New Zealand it has become established in waste areas and abandoned gardens, spreading via suckers. The sap, which is sticky and resinous, can cause contact dermatitis in sensitive people. ^ Korea National Arboretum (2015). English Names for Korean Native Plants (PDF). Pocheon: National Arboretum. p. 347. ISBN 978-89-97450-98-5. Archived from the original (PDF) on 25 May 2017. Retrieved 27 November 2016 – via Korea Forest Service. 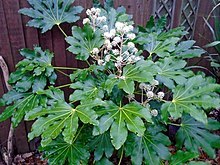 ^ "Fatsia japonica - Plant Finder". www.missouribotanicalgarden.org. Retrieved 2018-07-03. ^ "RHS Plant Selector - Fatsia japonica". Retrieved 19 June 2013. ^ "RHS Plant Selector - Fatsia japonica 'Variegata'". Retrieved 19 June 2013. ^ "AGM Plants - Ornamental" (PDF). Royal Horticultural Society. July 2017. p. 39. Retrieved 26 February 2018. ^ "Fatsia japonica 'Spider's Web' (v) Japanese aralia 'Spider's Web'". Retrieved 31 August 2018. Huxley, A., ed. (1992). New RHS Dictionary of Gardening. Macmillan. Wikimedia Commons has media related to Fatsia japonica. This page was last edited on 8 March 2019, at 02:27 (UTC).